Food allergy sufferer Daniel Kelly thought people needed to be made more aware of anaphylaxis (the resultant condition brought on by a severe allergic reaction), so that's what he decided to do. Daniel Kelly [pictured above], a creative/designer at fashion brand Ted Baker, has created an eye-catching campaign to highlight the right and wrong way to administer an adrenaline auto-injector pen. Today's release of the campaign coincides with Orange Wig Day, the national day of anaphylaxis awareness, organised by the Anaphylaxis Campaign, the only UK-wide charity solely focused on supporting people at risk of severe allergic reactions. Kelly, who suffers from a severe nut allergy, has built on a previous project (a magazine, which he created at university) which was the forerunner to his decision to embark on this new messaging which he hopes will educate people about anaphylaxis and its immediate treatment. 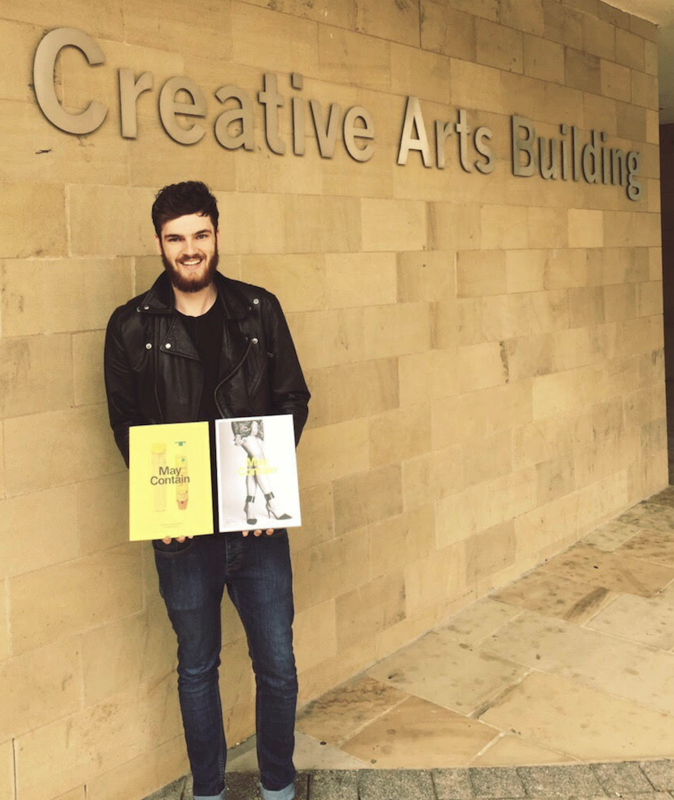 “I was very impressed with the quality of the May Contain magazine Daniel produced as part of his university project a few years ago," says Lynne Regent, chief executive of the Anaphylaxis Campaign. "I am delighted that Daniel is continuing to use his graphic design skills to raise awareness about severe allergies to coincide with the Anaphylaxis Campaign’s national day of anaphylaxis awareness, Orange Wig Day. Below, Kelly talks us through the campaign and his hopes for what it will achieve. How did your involvement/interest in the campaign about anaphylaxis and EpiPen use come about? Anaphylaxis is very personal to me: I have suffered with a severe nut allergy since I was five-years-old. I was shocked to discover around 20 people die each year due to anaphylaxis, yet the majority of people in the UK don't know how to use an EpiPen (an adrenaline auto-injector) correctly. Combining my personal experience with my professional life in brand messaging and design, I feel a responsibility to raise awareness and make more people familiar with the adrenaline auto-injector. Touch wood, I have never had to use my adrenaline, but I’ve had a few very serious allergic reactions and had to be rushed to hospital. You just never know. "Over 25 people a year die because of anaphylaxis; if one less person dies unnecessarily as a result of my campaign, then I will have achieved my goal." You created a magazine a few years ago, which covered this topic; what was the catalyst for that and why have you decided to revisit the topic? Growing up with a severe allergy influenced me for my final year project at university to raise awareness for anaphylaxis. I created May Contain based on the simple observation that many people simply don’t know what to do when someone has an allergic reaction, or how to administer the adrenaline auto-injector correctly. The magazine aims to take the adrenaline auto-injector out of a medical context and reposition it as a fashion accessory, with glossy photoshoots, stylish art direction, and inspired editorial storytelling. Above: Daniel Kelly's May Contain magazine, which he created at university. How was the magazine received online, did it raise awareness and reach your target audience? My local newspaper, The Huddersfield Examiner, published an article about May Contain. People were sharing it online, there was absolutely loads of positive reaction, and I was getting emails and messages from all around the world asking where people could find it. I was completely overwhelmed with emotion - it was just a university project with only a few printed! This reaction made me think more seriously about the project – there was clearly a desire there for it. "It soon came apparent that I wanted to create an allergy campaign that would raise more awareness than the magazine I created at university." Your approach this time has been to use artists to illustrate both the wrong and right way to administer an EpiPen®; what prompted that decision? It really annoyed me that in movies they always portray administering the EpiPen® incorrectly. I wanted to highlight this issue in a humorous way, and also show the public how to use it correctly. 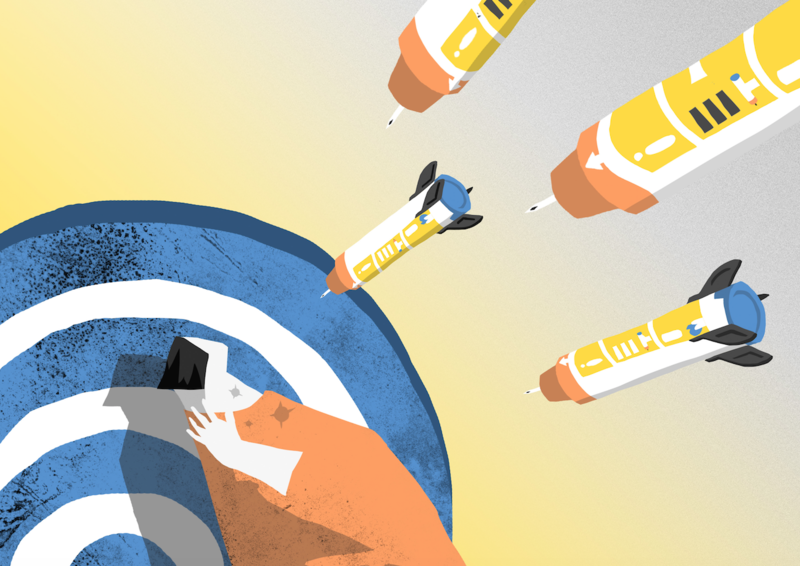 By collaborating with illustrators, I can help reach my audience more effectively and engage the public to find out more about the adrenaline auto-injector and its correct use. 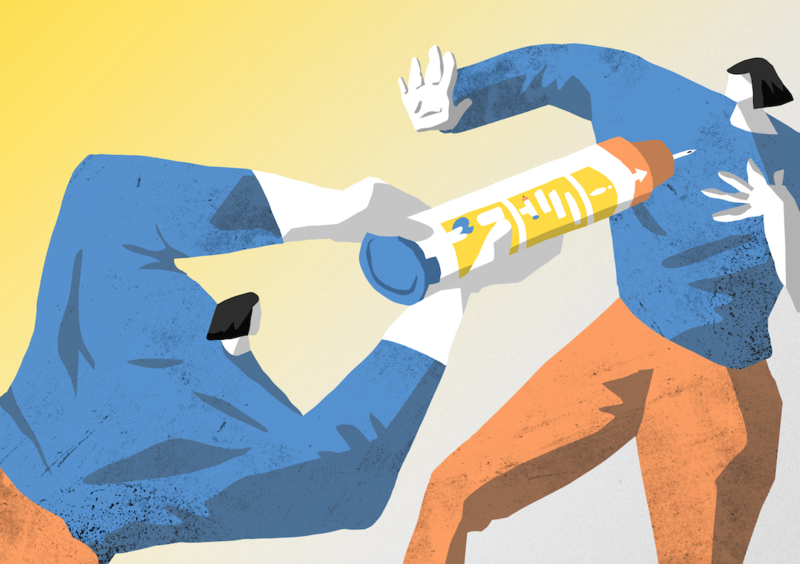 Above: One of the illustrations by Anastasia Yevtushenko showing how not to administer an EpiPen. How did you choose the artists in question and what was the brief you gave them? I was very fortunate, and thankful to the illustrators, for being involved, as I didn’t have any budget. However, two of my favourite illustrators wanted to help raise awareness, and they were just as excited as me about it. Both Thomas Hedger and Anastasia Yevtushenko have a very distinct and interesting style, that’s portraying a message while also containing elements of humour; I knew straight away that I wanted to have them involved in this project. When I contacted Thomas, I didn’t realise that he was an allergy sufferer as well and carried around an EpiPen®. He knew exactly what I wanted to achieve. It also made me realise that it’s such a small world - more people that you might think carry an adrenaline auto-injector with them. Getting the message across visually was absolutely key. Above: Kelly outside his university with a copy of his May Contain magazine. You have also created a website devoted to anaphylaxis and EpiPen administration; will that reflect the content of the illustrative campaign? As I started writing the content for the website, it soon came apparent that I wanted to create an allergy campaign that would raise more awareness than the magazine I created at university. I also felt most allergy blogs are aimed at parents rather than the teenagers/young adults living with the allergies. I wanted to create an allergy blog that targeted a younger audience and get them feeling more confident talking about their allergy. What do you hope this campaign will achieve? Over 25 people a year die because of anaphylaxis; if one less person dies unnecessarily as a result of my campaign, then I will have achieved my goal. Above: Another of Anastasia Yevtushenko's illustrations. You recently moved job to become a creative for Ted Baker, did working in advertising previously help you think about how you were going approach this project? When I moved to London my first job was a junior designer role at King Henry London which is the design department for adam&eveDDB. Getting the opportunity to work with so many talented creative directors and designers early on in my career has helped me see the bigger picture when it comes to thinking of an idea and approaching a project differently. You can read more about anaphylaxis by visiting Kelly's blog, called May-Contain, here.